In this episode, you’ll learn different ways you can understand your audience better from Rob Cassetti and Tom Schuler. Rob, thank you so much for joining me today and taking time out during the Museum Association of New York’s annual conference. I’m looking forward to getting your perspective on some of these questions, so we’re gonna dive right in. How do you attract new audiences within your community? One of the things we do is we first try to understand who’s coming. That begins with visitor surveys, doing things as simple as collecting zip codes, tracking the length of visit, motivations for visit. You know: Why did you come? Is this your first visit? And if it’s not, how frequently do you visit us? A lot of museums do surveys, and we’ve been told we’re a little bit different in that we then consume the survey. We think of it as our bible for understanding who’s coming and who’s not coming. Then how do we motivate that more? How do we get people to think about us differently, and come to visit? And so, simple tactics. If you live within a certain distance from the museum, your admission is half price, 50 percent off. We track visitors by zip code, and we use the first three digits of the zip code. So if you were in a 148, 149, and 169 zip code, you’re in the club. Fifty percent off your museum admission. Interestingly enough, just from a marketing perspective, if our ticket is $18 and I tell you it’s a $9 ticket, it’s way more attractive if I tell you it’s 50 percent off. We have been successful in public programming and specialty programming and driving that visitation. Visitors come for the program. We often think of certain categories of programming as what we call “door openers.” It gets you compelled to visit the museum because of a specific event, and then translating the door opener to regular visitation. We want to expose this new person to the Corning Museum of Glass, and then surprise them, delight them. A lot of our programming, we like to think of creating unexpected experiences. People in their minds kind of typecast what a museum experience is gonna be. An older perception of the museum was hands-off. It wasn’t kid friendly. So, when you come to a program that’s clearly hands-on and kid-friendly, you suddenly are changing perceptions about this institution. My own philosophy is, never pass up an opportunity to reshape people’s perceptions in a positive way about our institution. Even if it’s a purely academic moment, expose them to something beyond that. It’s proven to be a successful model for us. That’s fantastic. I want to take this conversation just a little bit further, and talk about how do you reach beyond that local market and your regional market? You mentioned the story in the Buffalo newspaper, but what kinds of things are you doing to attract that visitor audience? Well, of course, the number one thing is, there is no such thing as an advertising budget big enough to reach all those people. In fact, we have a very healthy advertising budget, but the reality is that we can reach about a 100-mile radius for a few months of the year, and yet we have visitors from every state in the union and 20-plus foreign countries every year. So, that is earned media. It’s people writing about us. Then, of course, the extra layer of social media…we have people on our staff who are remarkably good at that, who have taken very strategic and intelligent strategies around that. And then, of course, creating experiences that propel individuals to talk about us on social media. And to be able to leverage that in such a way. Of course, YouTube is the resource that it is for everything how-to. Exactly. So that’s proven. Fundamentally, it’s always useful to think of social media channels as essentially the media that you can manage and control. You can’t control all of it, of course, but it is your channel. It is your media space. And to take advantage of it, very strategically. The other thing that we do is, since 2002, we have been taking our glassmaking demonstrations on the road. It’s a beautiful thing. Our mission is to tell the world about glass. We do so at our museum, but we also can take that glass experience out on the road, and engage people in our glassmaking at live glassmaking demonstrations. It began almost by accident. It was an outdoor demonstration we didn’t want to have snowed on. At the last minute, we put it in a trailer, and within a year, we had been invited to blow glass at the Salt Lake City 2002 Winter Olympics. So, we found ourselves having created something that people were very interested in. Since then, we’ve gone to nearly 40 cities around the world, and for nearly 80 individual deployments. It’s actually kind of a division of our programming, called Hot Glass Outreach Programming. Typically, we’re invited by museums or public events to bring this activity there. So it’s accomplishing two things. One, it’s pure mission. We’re teaching people about glass, the thing we love. It’s also pure marketing. And so, the word of mouth, the interest that creates, is just incredibly, incredibly powerful. Yeah, that’s incredible. I like how it’s mission-specific, but also at the same time provides that kind of grassroots marketing. That is so important when you don’t have a budget that can get you much further than 100 miles out. I’m gonna ask you, actually, to elaborate on it, because I do know you’re getting ready to kick off another outreach with your glass making. Can you tell us a little bit about what’s in store, coming up this summer? It’s a project called the Glass Barge, which we prototyped last year. This year, it’s our full deployment. We’re celebrating the 150th anniversary of glassmaking coming to Corning. Glassmaking came to Corning from Brooklyn. It’s a factory that relocated to Corning in 1868, which grew up to become today’s modern Corning, Incorporated. Glassmaking has been taking place continuously in Corning ever since then, both the company, but also here at our museum, and then other glass production facilities and companies. It seemed like a good and appropriate thing to celebrate, and to celebrate it, we decided to put one of our mobile glass blowing units on a barge, build it out as a public venue that can seat 150 people. We’ll go from port to port from Brooklyn, which will launch in May, up the Hudson over the course of June, the Erie Canal, July and August, and then to the Finger Lakes in September. We’ll arrive in Watkins Glen the second week in September, and so basically a four-month journey. It can’t get all the way to Corning by canal boat anymore. The last 20 miles is no longer navigable. But, we’ll then have a huge celebration, towards the end of September in Corning, New York. That’s really awesome. Before you can go back to the conference activities here. What are your organization’s goals for the next three to five years? Our mission is to tell the world about glass, and we continue to look for inspiring ways to do that. We have a remarkable glassmaking school called The Studio, celebrated its 20th-anniversary last year. About 1,000 students a year study glassmaking there, and about one in four of our daily visitors go there to try glassmaking for the first time, a program we call Make Your Own Glass. It is a profoundly fun and educational experience, all rolled into one. Where else in the world can you go and try your hand at glassmaking, with no experience? The Studio is long overdue for a significant expansion. We’re bursting at the seams, and with the popularity of all of our programs, there is a demand that outweighs what we can do right now. So, a major institutional priority is to put a project together to be able to expand our glassmaking school. We think a visit to the Corning Museum of Glass is to see glass, which is the history of glass, the artistry of glass, contemporary glass, and the science and technology of glass. You’re seeing all of those things, also in very interactive ways. To see glassmaking, and live glassmaking demonstrations. Then, kind of seal the deal, make glass yourself. It’s the combination of those three things, that add up to a remarkably profound experience. I’m tempted to say a remarkably profound museum experience, but it goes beyond that. It’s something that registers on so many levels. Of those three things, the one that really — it’s time to upgrade to the next level — is the opportunity to make your own glass, and to study glass deeply at the studio. It’s an incredibly important, forward-looking project. It’s one of those projects that we know, once complete, will serve us well for decades. And so, it’s a very exciting time to be at the museum as we embark on that journey. That sounds really awesome. Well, thank you very much for sharing so much with us today, and we’ll definitely catch up with you again. What a great conversation with Rob, I really appreciate his philosophy of “never passing up an opportunity to reshape people’s perceptions in a positive way.” Here is my conversation with Tom on how the Met is reaching new audiences. I’m looking forward to getting your perspective on these questions. And we’ll just dive right in and start with the first one, which is, how do you attract new audiences within your region? We get over 7 million visits to the museum yearly, and we always want to see that number grow. And right now, new audiences, we track them by events, and we track them by, of course, our exhibitions, and we also attract them by the amazing special collection that we own. It’s just something that people go out of their way to come and see. Wow, that’s awesome. I just want to back up a little bit, you mentioned that you have seven million visitors a year and that you track them through your events and exhibitions. Are there certain kind of traffic trends that you’re seeing? It’s interesting because our New York City visitorship is going up, so they’re now 31 percent of our overall visitorship. That’s been a constant, I would say, in the last five or so years. That number has been trending upwards. An interesting note is that our age demographic is actually going down. So right now, the average age is about 41 years old, and that’s a big change for us over the years as well. As I said, that’s trending down. And 40 percent of our visitors are first-timers, which is really exciting. We think that’s part of the younger age group, and seeing more New Yorkers, particularly Outer Boroughs, which we made a push to. Try to get the folks from Queens and Brooklyn and the Bronx to the MET. We want them to see the Met as their living room. Yeah, that’s terrific. Are you doing any kind of special programming that’s pulling them in from the Outer Boroughs? Well, particularly on a Friday night. We’re open until nine o’clock on Friday and Saturday nights, and we’re calling it “New York City Night.” We’re trying to attract New Yorkers to come and spend some time here and just enjoy the museum. That’s really awesome! So, being that you’re located in New York City, you kind of have this natural. And you’re so close to, well, Central Park, and of course Times Square, and so many iconic places where visitors go, but how are you reaching those visitors and getting them to make the decision to stop at the MET as well when they’re on their vacation? We’ve enhanced our social media. We have a fabulous team that’s working on all different aspects of social media. I always like to say I’m a Luddite, but those folks there are just truly amazing in terms of what they’re able to get out, and what they’re able to promote, and what they’re able to just get online, with Twittering, and Facebook, and everything, so I think that’s probably one of the reasons we see that average age trending downward. It’s probably our social media activity. We’re also exploring this whole idea of the museum being a community anchor. We do some amazing stuff that, like I just said it before, “Come to the Met, let it be your living room.” Community for us is school groups: people that don’t come to the museum traditionally. Last year we had 230,000 young people come to the Met in school-organized visits, whether they were guided tours or self-guided tours. To me, that’s like the next generation of museum-goers. And when they come they get a free family pass to take home so they can come back with their family. It’s something that we’re so proud of, and they all come for free. So that is just one of our crowning achievements. Wow, that’s terrific. That sounds like a great program. Are there other things you’re doing in terms of the arts? Well, we also have a group that’s called MADI, the Multicultural Audience Initiative. 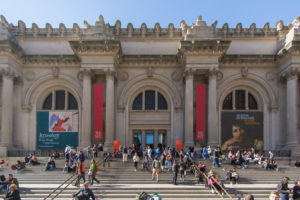 And that’s an organization within the museum that tries to attract non-traditional museum-goers, and it tries to attract folks who may not see the Met as the place for them. But, we have an advisory group made up of folks from all different neighborhoods and throughout the city, and it’s very diverse, and its aim is to bring those groups in that might not see the MET as somewhere that they might find interesting something that is not theirs, but when they get there they say, “Oh my god, I can trace my ancestors, I can do all this, all this amazing artwork!” It’s fascinating to see that group in action. That’s fantastic. Now, looking into the future, what are the goals for the Met in the next three to five years? I think that the two big things that we want to continue to focus on: attracting a more diverse audience, and continue to bring in those locals, from the Outer Boroughs, and have a sustained visitorship that comes from New York. It’s important, I think, to remind everyone that note — when you go to visit the Met, when you live in New York state, you can pay what you wish to come in. So, if you want to give a dollar, you’re welcome to come in and pay a dollar, and you get to see some of the greatest art in the whole wide world. And it’s at New Yorkers’ fingertips. And when I say New York, I mean all of New York State. Of course. Absolutely. Well, that sounds really great. I appreciate you taking some time out of this conference to share with us today. Is there anything else that we didn’t cover that you think would be important for our listeners to know? I was just elected to the MANY Board. Yes! I’m very excited. Thank you, thank you. That’s awesome. Well, thank you very much, Tom. I appreciate it.